The 2016 Mazda CX-5 Grand Touring Review: The CX-5, Mazda’s compact crossover, debuted in 2012, but has been improved every year since. Now 2016 brings subtle changes, and all contribute to a fun-to-drive, economical, and quiet package. 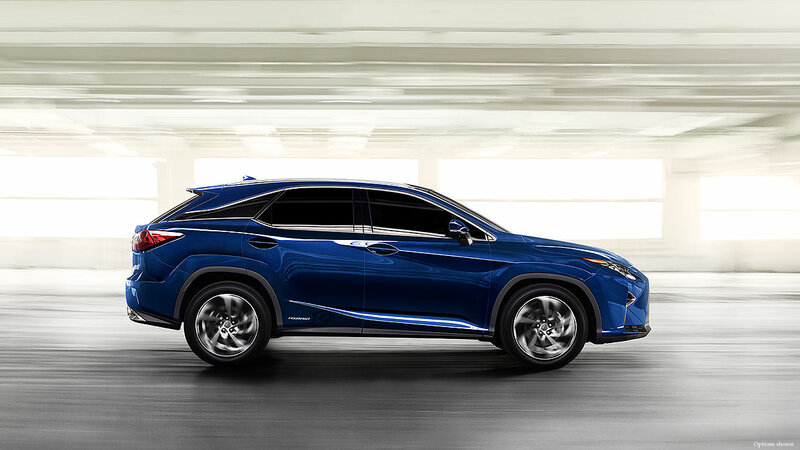 The CX-5 comes in three trim levels: Sport, Touring, and Grand Touring. The basic car uses a SKYACTIV 2.0-liter four-cylinder engine that delivers 155 horsepower and 150 lb.-ft. of torque. This model can be matched to a manual six-speed, so you can enjoy some of the driving fun of the iconic MX-5 Miata while still carrying your family and 34.1 cubic feet of stuff. Drop the second seat and you’ll have 65.4 cubic feet. Opt for the automatic, which is standard in the other two levels, and you’re up to 2.5-liters and 184 horsepower and 185 lb.-ft. of torque. My Soul Red Metallic Grand Touring test car had that hearty powertrain, and it moves the 3,589-pound crossover along energetically. Push the new-for-2016 Sport Mode button and the electronics offer a more exciting driving experience. You can select front- or all-wheel drive in the CX-5, but you can only have four-wheel traction matched with the automatic. It would be handy for unpleasant weather conditions, if that’s common in your part of the country. It’ll set you back an additional $1,250. EPA fuel economy numbers are 24 City, 30 Highway, and 26 Combined. The smaller 2.0-liter choice, with manual, ups that to 26/35/29 respectively. I averaged 23.9 mpg. Green numbers are 5 for Smog and 6 for Greenhouse Gas. Compact crossovers like the CX-5 are a sweet spot in the vehicle business now. The original CX-5 came only with the 2.0-liter engine, and felt underpowered compared to competitors such as the Honda CR-V and Toyota RAV4. Today, the 2.5-liter engine cures that. Continuous refinement helps make the CX-5 a success. For example, this year’s car is about 10 percent quieter inside on the highway. The ride is flatter and smoother, thanks to updated front and rear suspension dampers with optimized bushing shapes on the lower suspension control arms. You won’t see those in the showroom but you’ll feel them on the road. 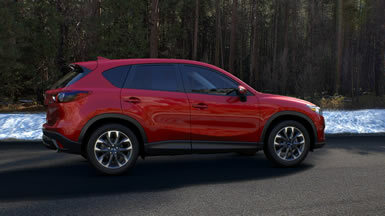 The CX-5 introduced Mazda’s Kodo design language, which has now spread across the brand. It isn’t as flashy as some current cars, but has carefully defined forms that integrate well. Armrest shapes inside, for example, look and feel substantial. The dash panel design is clean, and fit and finish are superb for a mainstream vehicle. Mazda reshaped the front and rear seat cushions for more comfort. For example, the rear cushions are longer, although I personally didn’t sit there to test them. As with most cars, you can begin with well-equipped basic version and move up. The Grand Touring may be the top level, but you can still add more. My tester had the i-ACTIVESENSE package of safety features ($1,500). It brought in radar cruise control (keeps distance between you and the car in front), lane departure warning, high beam control, and Smart Brake Support. The latter feature uses the car’s electronic sensors to automatically brake when the car detects an emergency ahead. Not part of this package, but still important (and standard on my tester), is Blind Spot Monitoring, which incorporates Rear Cross Traffic Alert. These features, increasingly common, prevent accidents by increasing driver awareness—always a good thing. Also aboard was the Tech Package ($1,155), with adaptive front lighting and numerous applications of LED technology. If you’ve bought bulbs for your house recently, you know that this is where things are headed—clearer light with lower energy consumption. Mazda uses LEDs for headlights, daytime running lights, fog lights, and taillights. My time in the CX-5 was a pleasure. It’s a good size for freeway commuting as well as local errands. The rare opportunity to get into uncrowded back roads lets the Mazda come alive on the curves. I’d expect that the 2.0 with manual would be especially engaging, but the 184 horsepower of the 2.5-liter is welcome on freeway onramps and in passing situations. Steering feel, road surface awareness, and a fine sensation of control distinguish Mazdas from the competition. Prices range from $22,695 for the Sport 2.0-liter with manual transmission and front wheel drive to the Grand Touring with all-wheel drive at $30,370. My tester, including the extra packages, came to $34,485.